This is a continuation of the process post from a few days ago. When I started coloring this picture, I didn't know that this one was going to be my final version. I started with the intent of just testing colors and techniques, but the image started looking so nice, that I decided to run with it. Usually, I suggest doing a quick color test on anything large or complex. On this image, testing involves trying colors of the skin, beads, and how to get the texture on the snake skin. This photo is my first color test. You can see that there is a slight color variation between his face and the rest of his body. I was testing the idea of adding a faint green to the shadows, to accent the beads and to add variety from the tones on the snakeskin. Notice how I bled out of the lines BADLY on the elbow, and to a lesser extent on the snake. I'm not worried because I know that I can clean that up with the colorless blender, and if I can't, I know that I will be erasing that area anyways once I scan in the final picture. I don't remember what colors I used for this image, sorry! I do know that I used G21 on the beads, a base skin tone of E50, and I used a lot of Y28, to the point that I had to borrow a Y28 from my set at work to finish the image. This next step-out photo shows the base yellow under all the snakes. I took these pictures with my phone, so be aware that the colors looked a lot smoother in real life. I know I've mentioned it before, but base tone makes a huge difference, particularly in this image, where I am using the colorless blender to add texture to the snakes. The yellow base will come through the dots of colorless blender, even after I layer on a few more colors. For those of you who know how much I promote the use of contrast in skin colors, note how dark I go on my skin tone shadows. I also added hints of the same G21 I used on the beads into the darkest tones, to pull those colors together a bit more. Here is a close-up of the snake-heads in progress. See how I color them smoothly with a range of tones, then go in and add the textures with my colorless blender? I touched, dot-by-dot, with my sketch blender pen to get the fine dots. In this image you can really see my layers of green also incorporated on the snakeskin. Just so you know, the paper makes a huge difference. I work on a thin, tight-fibered paper so that my edges are crisp when doing this technique. Because the paper is thin, I use less ink, and my colorless blender has an easier time moving ink around. 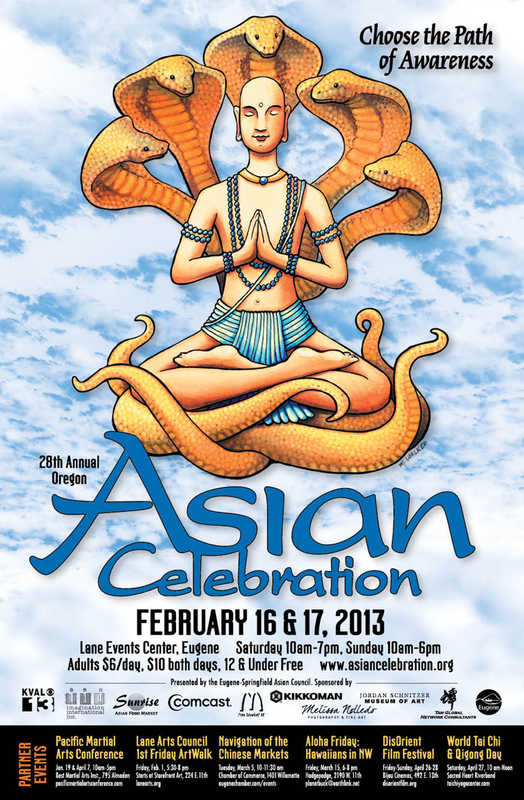 Here is the final, scanned, color corrected image I submitted to the Asian Celebration Committee. I think the skin highlights came out a bit lighter than I wanted, but overall, I am pretty pleased with the way this came out. However, after this was done, we changed our mind about the color scheme on the final poster. I was not about to re-color the whole picture! This took hours and hours to color. Luckily, in this day and age, we are blessed with Photoshop. Here is the final artwork, incorporated into the finished poster. Notice what changed? I'll be demoing Copic Markers each afternoon from 3-4 in the youth art room during the Celebration. I hope to see you there. I hope you enjoyed this brief glimpse into the process and how artwork can easily change over time. Have a great weekend! Time to briefly update our upcoming classes. Some of our classes are filling fast, so if you are interested in attending, register now. We will have fewer locations this year than in the past, so if you see a class come up and it is only a few hours from you, then register right away! Chances are that will be the closest location for this year. These classes are the perfect way to gain a solid foundation in using Copic markers. Learn how to choose papers and ink, how to blend, and experiment with airbrushing. For more details, please visit our website and download applications and information on each class. Feb. 1 Irving, TX taught by Cindy Lawrence Almost Full! 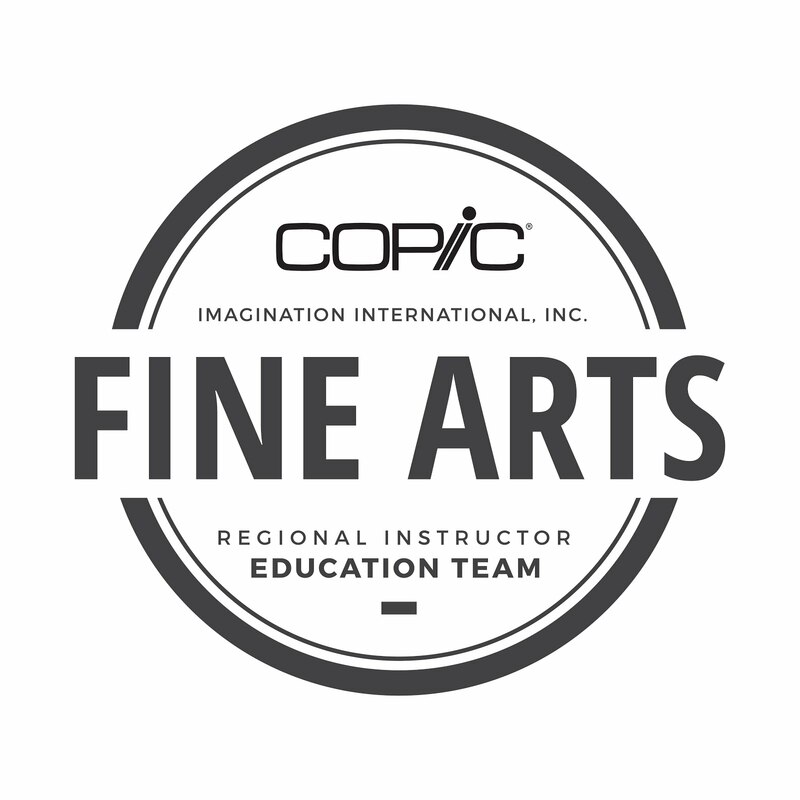 These classes are a great way to expand from the basic technqiues learned in the Standard Certification and make your work more artistic. For more information and for applications, please visit our website. Our first class went amazing! Read this awesome blog post by Sandy Allnock . She had a blast at the class, and we know you will, too. The workshop series is our new project-based, intensive workshop! Come spend two days perfecting your Coloring skills and creating amazing new projects. Explore coloring on a variety of surfaces, and get an in-depth airbrushing experience. The only prerequisite is the Standard certification. 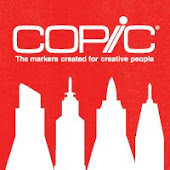 You can register at the Copic Website. This class will only be offered 9 more times this year, and next year it will be a whole new series, so register now for any classes near you. Feb. 22 & 23 Orlando, FL taught by Sherrie Siemens and Colleen Schaan Register Today! March 22 & 23 Phoenix, AZ taught by Debbie Olson and Cindy Lawrence Register Today! 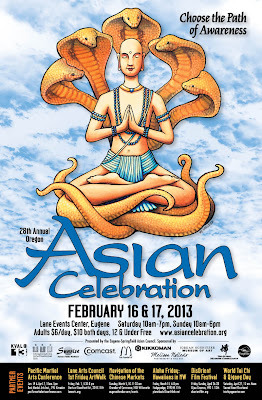 Each year I look forward to sharing the artwork I create for the Oregon Asian Celebration. This year, the process went pretty smoothly, so I'd like to share you how I go about working with a client, to get the image that will make both sides happy. I initially met with their graphic designer and discussed the theme. 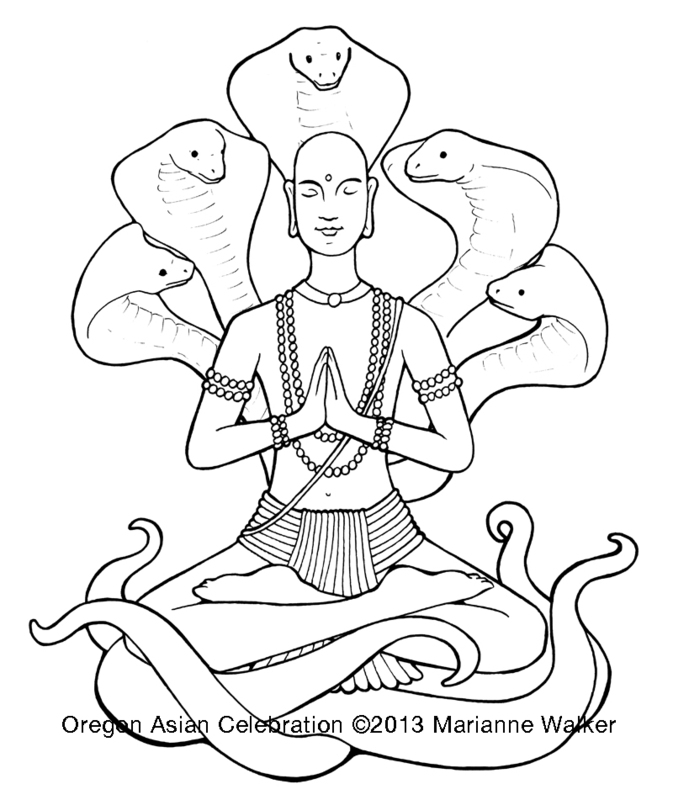 This is the year of the snake, and the theme they wanted to go with is "Choose the path of Awareness". We wanted to focus on the snake, but also balance, harmony, and peace. This was tricky, as most of the art they had looked at from others included snakes, but they seemed to be in threatening poses. 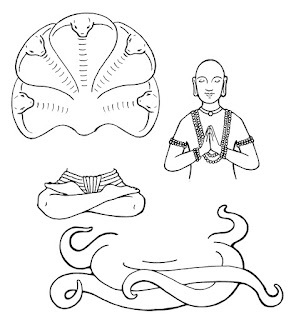 So we started searching the internet for Asian/Indian/Pacific Island images including snakes. 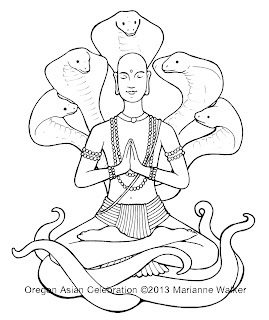 We found lots of tattoos, but in our searching, we found the perfect balance of peace, tranquility, and snakes. Here are some of the google image searches that caught our attention. 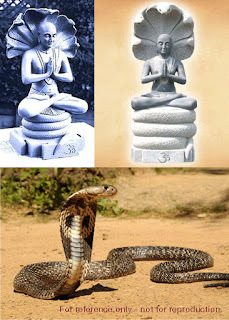 In our searching, we found this statue, and decided to base our image on this figure. In researching we found that this is a statue of one of the early founders of Yoga, Patanjali. 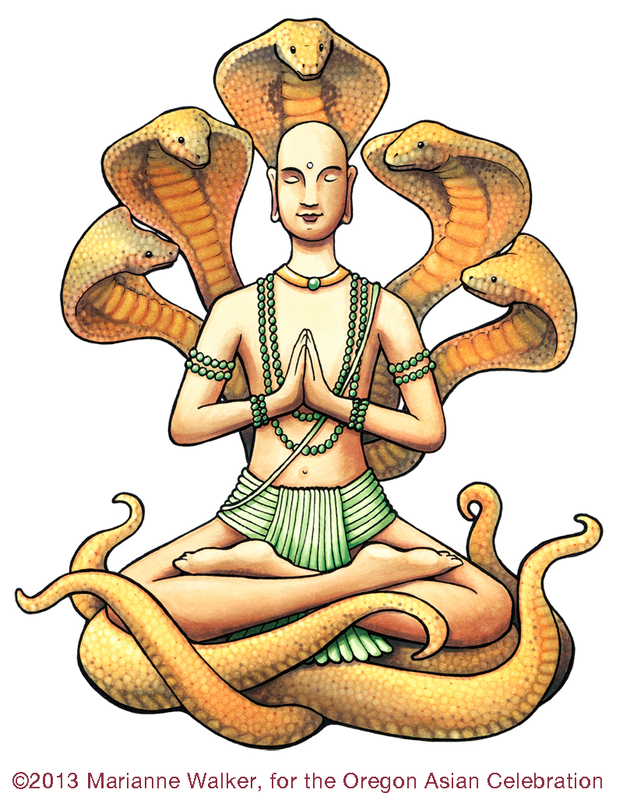 His statue is usually depicted as seen here, with the figure meditating, hooded by cobras. He rests on a series of snake coils. So, a week or so later, I sent the clients my initial sketches. 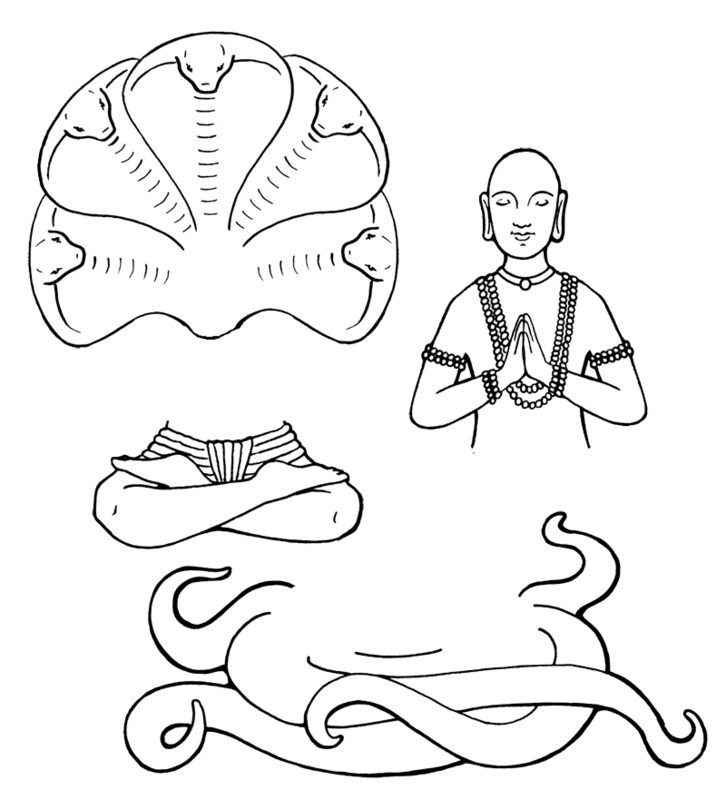 Here are some of the initial drawings. Each time, they came back and suggested changes. It is fun to see the progression of a drawing like this. Not that any of these are really bad drawings, they just didn't convey the feeling the client wanted. Some are really rough, some are much cleaner. When drawing a complex image like this, and knowing that my client will want changes, I make most art versions as two or three layers (the third drawing was a rough sketch, so it did not get the same treatment). Many times your client will say something like: "I like the guy, but the snake tails don't work." By drawing each as a separate layer, it makes it much easier to swap out one part- I don't have to redraw the whole image. Here is the 2nd version, with the different layers broken apart so you can see how I drew them. Finally, after much going back and forth, and getting approval from everyone who needed to see it, I created an image that everyone was happy with. You can see traces of the original statue, but it has more life and feels more open and inviting. The key to success in freelance illustration is being flexible. A committee rarely likes your favorite version, but remember, you are working for them, so they are paying you for what they want. I really would have had a lot of fun drawing and finishing the 3rd version, but I knew that image would not fly with the committee, so I only sent a rough sketch (I didn't have time to draw it nicely, knowing that the client would not approve it). it also helps that I have worked with them for many years, so I can gauge better what they will and won't like. I still sent in the rough sketch, just on a long shot that they might like it. A simple tip for working with clients: When you are working on a project like this, try not to send your full, high-res files until the last, or until they are ready to pay you. In a few days, I will show you a few steps in the coloring process, and I'll show you the final poster. I hope you enjoy seeing a bit more of the behind-the-scenes process when working with a client. Cindy, thanks for hopping along with us, and I hope you continue to have a very lucky New Year! Happy New Year Blog Hop! 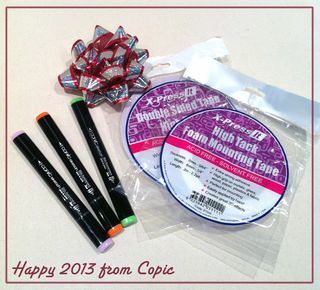 Happy New Year from Copic! Ooops! This was supposed to have auto posted yesterday but it disappeared. Sorry!! please enter today for your chance to win! There are so many new things happening in 2013 at Copic that we just can't hold back our excitement. In less than two weeks we will be kicking off our new Color & Ink Workshop at CHA. There's still time to register, but space is limited, so sign up now on the Copic Website HERE. This class is all about HANDS ON and HAVING FUN! This year at CHA we will be expanding our fabulous line of X-Press it adhesives. Stop by our booth (#2553) to see our new glue, glue markers, and double-sided adhesive sheets, along with all of our other fabulous rolls of double-sided tape and foam tape. We will be showcasing a lot of new marker sets, including our new 3pc. Sketch blending group sets. These are a great way for beginners to start their collection, with markers that go together beautifully. We are also scheduling locations for our Standard and Intermediate Certification classes for 2013. Make sure to sign up on the Copic websiteHERE to find out when one opens near you! To celebrate all the excitement, the education team and designers are having a fun blog hop and giving away a fun prize pack. Each prize pack will include an assortment of 3 markers from one of our Limited Edition 25th Anniversary sets (fine nib on one side, super brush on the other end), a roll of X-Press It 1/4in. high-tack tape, and a roll of our exclusive 1/4in. foam tape. For a chance to win, leave a comment on THIS post by Friday morning, January 4th. 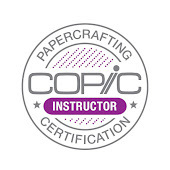 Then hop over to each of the other wonderful Copic instructors and designers. Each blog will give away their own prize, so you have 8 chances to win!! Note: Due to shipping restrictions, contest is only open to residents of US and Canada.